Our company is engaged in providing superior quality Industrial Cooking Vessel, which is widely used in hospitals, canteens, clubs, educational institutions and resorts. Made using high grade stainless steel, it is in compliance with the international quality standards. Offered in different capacities, volumes and finishes, our range is globally appreciated for its longer applicability and perfect finish. We are looking for queries for Steel Kitchen Equipment And Accessories from Tamil Nadu, Kerala, Karnataka & Andhra Pradesh. We offer a broad range of Tilting Boiling Pan, which is manufactured using stainless steel and other quality raw material. Available in capacities of 60 & 90 liters, it is extensively used for roasting, sautéing and braising of meat, rice & vegetables. In order to attain maximum satisfaction of our clients, we also provide our range of Tilting Braising Pan in customized forms. 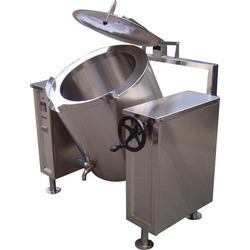 We provide an extensive range of Idly Cooking Plants, which are made using high grade quality material and latest techniques for their higher functionality and longer service life. These Idly Cooking Plants are stringently scrutinized on various quality parameters to provide a flawless range in the market. Nominal price are being offered on all our products. Made of 304Gde 16SWG SS sheet This unit is contains a chamber. This is mounted on SS stand. 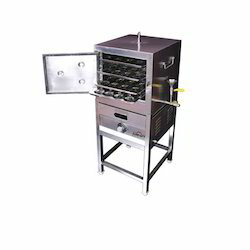 Racks will be provided underneath to keep Idly plates, idly boiled within 5 to 7 Mts Heat resistance door with auto Steam injection, Moreover, we also provide Idly plant in customized forms..
We are offer of Puttu Maker that is innovatively designed products helping to minimize the time in Puttu making. These are available in a wide range and are made from best quality raw materials. These products are widely appreciated for their durability and effectiveness. These products have a wide application in the Canteen, Hotel and Cafeterias. Moreover, we also provide Puttu maker in customized forms. 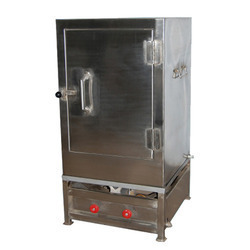 Our company is engaged in providing superior quality Steam Cooking Unit anti-corrosive nature., which is widely used in hospitals, canteens, clubs, educational institutions and resorts. Made using high grade stainless steel, it is in compliance with the international quality standards. Offered in different capacities, volumes and finishes, our range is globally appreciated for its longer applicability and perfect finish. We are the foremost manufacturer and supplier of quality approved range of unit that is used on daily basis in commercial sectors. 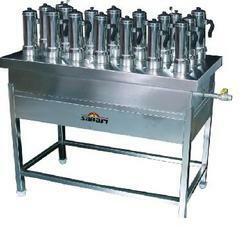 Moreover, we also provide steam cooking vessels & boilers in customized forms. Square or Round Type As Per Customer's Requirement. LPG /Fire Wood Model As Per Customer's Convienence. Made of 304Gde 16SWG SS sheet This unit is contains a chamber. This is mounted on SS stand. Racks will be provided underneath to keep Idly plates, idly boiled within 5 to 7 Mts Heat resistance door with auto Steam injection, Moreover, we also provide Idly plant in customized forms. Our company is engaged in providing superior quality Steam Cooking vessels, which is widely used in hospitals, canteens, clubs, educational institutions and resorts. Made using high grade stainless steel, it is in compliance with the international quality standards. Offered in different capacities, volumes and finishes, our range is globally appreciated for its longer applicability and perfect finish. The vessel is an ideal way to prepare rice and other boiled items like dal, sambhar, vegetables, and others. We provide an extensive range of Idiyapam Cooking Plants, which are made using high grade quality material and latest techniques for their higher functionality and longer service life. These Idly Cooking Plants are stringently scrutinized on various quality parameters to provide a flawless range in the market. Nominal price are being offered on all our products. Made of 304Gde 16SWG SS sheet This unit is contains a chamber. This is mounted on SS stand. Racks will be provided underneath to keep Idiyapam plates, idiyapam boiled within 5 to 7 Mts Heat resistance door with auto Steam injection, Moreover, we also provide Idiyapam plant in customized forms. We render our clients with a wide assortment ofBulk Cooker, which is available in different models and capacities. Manufactured using high grade stainless steel and latest technology, it is suitable for cooking food in an easy and convenient manner. Our range of Bulk Cooker consumes less fuel and can also be custom design to suit the varied requirements of our esteemed clients. 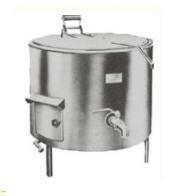 Looking for Commercial Steam Boiler Cooking Vessels ?